Cast copper alloy Anglo-Saxon cruciform brooch from the 6th century AD. The side and top knobs are semi-circular and hollow and have been cast integrally to the brooch. The headplate is square with a slightly raised sub-rectangular central panel which runs from the top knob to where the head meets the bow. This panel widens towards the bow. The bow is concave and has a central vertical grooved line as decoration. The lappets on each side of the flat panel below the bow extend vertically outwards before curving downwards and narrowing to a rounded terminal. The upper part of the catchplate is on the reverse of the flat panel. The foot has a zoomorphic terminal with two eyes picked out by raised dots and nostrils picked out by curved grooves above the spatulate extension. It has been repaired in antiquity, just below this flat panel section, and the terminal has broken off since that repair. It appears the repair was made by putting two circular rivets in the foot, in between the terminal and the flat panel. A small repair piece must have been attached to the brooch by these two rivets in order to hold the two parts together. The upper rivet is now missing as is this stabilising piece although a hole can be seen on the top of the terminal piece. The base of the main piece is irregular with a section missing, showing how the brooch broke. 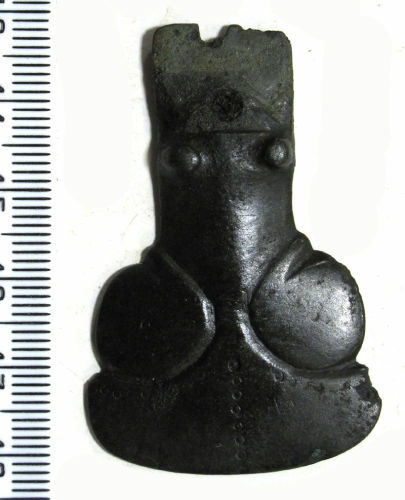 Martin (2015, 267) has classified this brooch as Type 3.2.1 "Londesborough", the most populous Cruciform brooch type. Other examples identified within the region include Greenbank Darlington (Miket and Pocok 1976), Andrew's Hill Co. Durham (Hamerow 1995). See also Grave Assemblage DUR-75B54D, with two further Teesside examples. Hamerow, H., Pickin, J., CAPLE, C., CLOGG, P., HENRY, P., LANGSTON, J., 1995. An Early Anglo-Saxon Cemetery at Andrew's Hill, Easington, Co. Durham. Durham Archaeological Journal 11, 35-66. Martin, T.F., 2015. 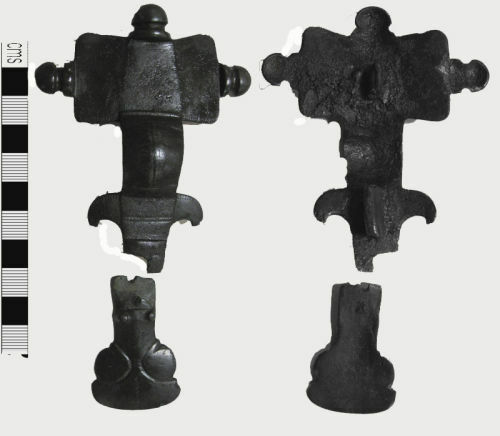 The cruciform brooch and Anglo-Saxon England, Anglo-Saxon studies. Boydell Press, Woodbridge, Suffolk, England. Included in Martin 2015 as catalogue no. 658.